Chandrika Bandaranaike Kumaratunga (b. June 29, 1945) was the fifth President (and fourth to hold the office as Executive president) of Sri Lanka (November 12, 1994 – November 19, 2005). She was the leader of the Sri Lanka Freedom Party until the end of 2005. She was Sri Lanka's first female president winning two consecutive terms. She rose from provincial chief minister to Prime Minister to President within two years. Her father and mother were both Prime Ministers; her mother was Sri Lanka's and the world's first female Prime Minister. Her father was assassinated in 1959. Vijaya Kumaratunga, her husband, was killed in 1989. In 1999, she survived an assassination attempt in which she lost all vision in her right eye. Only 23 women previously had headed their countries as elected leaders when Kumaratunga became President. In power, she pursued a policy of economic liberation and emphasized the need for a political solution to the Tamil revolt in the North East section of Sri Lanka, attempting both to win the military battle and to negotiate a settlement that would grant the Tamils increased autonomy. Her devolution policy was unpopular with her own party but she courageously pursued this, and to some degree caused opinion to swing in her favor. Election of the opposition party to government in 2001, when Ranil Wickremasinghe became Prime Minister, hampered her ability to implement her policies. Her economic efforts were also stalled somewhat by the Indian Ocean tsunami of December, 2004. Briefly, following this natural disaster, the country did unite across racial divides. Kumaratunga was named by Forbes as the 25th most powerful woman in the world. Following the assassinations of her father and husband, she knew that politics could be risky but nonetheless chose to enter public life, expressing belief that she was the right person at the right time to lead her nation in the face of the circumstances of the day, more than hinting that she was destined for this role. Coming from a family that has a long history in the socio-political arena of the country, her father, Solomon Bandaranaike was a government minister at the time of her birth and later became Prime Minister. He was assassinated in 1959, when Chandrika was fourteen. Chandrika's mother, Sirimavo Bandaranaike, then became the world's first female prime minister in 1960 and her brother Anura Bandaranaike was a former Speaker of the Parliament of Sri Lanka, a former minister and is currently a member of parliament. Her grandfather, Sir Solomon Dias Bandaranike was the Maha Mudaliyar, (the chief native interpreter and advisor to the Governor) during British colonial rule. Chandrika spent five years at the University of Paris, graduating from the Institut d'Etudes Politiques de Paris (Sciences Po) in political science. While in Paris she obtained a Diploma in Group Leadership from the same University. Her Ph. D studies in Development Economics at the University of Paris were interrupted by the call to serve her country, where her mother’s government had launched a wide ranging program of reform and development. During her days in France, she was active in the Student Revolution of 1968. She is fluent in Sinhala, English and French. After returning to Sri Lanka, she took up politics in the Sri Lanka Freedom Party and in 1974 became an Executive Committee Member of its Women's League. Following the Land Reform in Sri Lanka in 1972- 1976, she was Additional Principal Director of the Land Reform Commission (LRC). In 1976-1977 she was Chairman of the Janawasa Commission, which established collective farms. In 1976- 1979 she acted as a consultant to the Food and Agriculture Organization (FAO). She stayed in active politics supporting her husband's party Sri Lanka Mahajana Party by leaving the SLFP. After Vijaya Kumaratunga was assassinated she left the country for the UK, working for UNU-WIDER (United Nations University-World Institute for Development Economics Research) during her time there, not returning till 1991. Kumaratunga was elected as the Chief Minister of the Western Province of Sri Lanka in 1993 in a land slide election victory. Kumaratunga herself was elected Prime Minister of a People's Alliance (PA) government on August 19, 1994, and President in the presidential election held shortly thereafter in November. She won 63 percent of the vote. Her election ended 17 years of UNP rule. She appointed her mother to succeed her as Prime Minister. Early in her term she made conciliatory moves towards the separatist Tamil Tigers to attempt to end the on-going civil war. These overtures failed, and she later pursued a more military-based strategy against them. In October 1999 Kumaratunga called an early presidential election. She lost vision in her right eye (permanent optic nerve damage) in an assassination attempt, allegedly by the separatist Tamil Tigers, at her final election rally at Colombo Town Hall premises on December 18, 1999. President Kumaratunga defeated Ranil Wickremasinghe in the election held on December 21, and was sworn in for another term the next day. 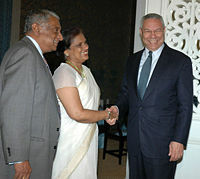 Kumaratunga (center) meeting with former United States Secretary of State Colin Powell (right). In December 2001, she suffered a setback in the parliamentary election. Her People's Alliance lost to the UNP, and her political opponent Ranil Wickremasinghe took office as Sri Lanka's new Prime Minister. She continued as President of Sri Lanka although her relationship with the Wickremasinghe government was a strained one. In February 2002, Wickremasinghe's government and the LTTE signed a permanent ceasefire agreement, paving the way for talks to end the long-running conflict. In December, the government and the rebels agreed to share power during peace talks in Norway. President Kumaratunga believed Wickremasinghe was being too lenient towards the LTTE. In May 2003 she indicated her willingness to sack the prime minister and government if she felt they were making too many concessions to the rebels. On November 4, 2003, while Prime Minister Wickremasinghe was on an official visit to the United States, Kumaratunga suspended Parliament and deployed troops to take control of the country, effectively putting it into a state of emergency. Kumaratunga's PA and the leftist Janatha Vimukthi Peramuna or JVP (People's Liberation Front) formed the United People's Freedom Alliance (UPFA) in January 2004. Having won the election held on April 2, 2004, the UPFA formed a government with Mahinda Rajapaksa as prime minister. This marked the first time in history that the JVP became a partner in a Sri Lankan government. However, in June 2005, the JVP left her government over a disagreement regarding a joint mechanism with LTTE rebels to share foreign aid to rebuild the tsunami-devastated Northern and Eastern areas of Sri Lanka. The JVP contended that the Tamils would divert funds to finance their guerrilla activities. Kumaratunga argued that without working with the Tigers, aid would not reach people in time to help them. 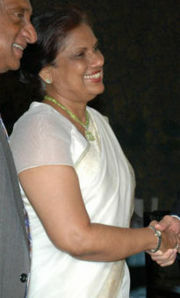 Kumaratunga's six-year term ended in 2005. She argued that since the 1999 election had been held one year early, she should be allowed to serve that left-over year. This claim was rejected by the Supreme Court and Kumaratunga's term was ended in November 2005. In the 2005 election, Rajapaksa succeeded her as president, leading all 25 parties in the UPFA. Kumaratunga noted recently in 2007, "I sincerely tried to reach a political consensus to solve the ethnic question, and tried to introduce a pluralistic constitution that would cater to the political aspirations of the Tamil people without dividing the country". Chandrika married movie star and politician Vijaya Kumaratunga in 1978. Vijaya Kumaratunga was assassinated on February 16, 1988, outside his residence in the presence of Chandrika and their two little children then aged five and seven years. The extremists Janatha Vimukthi Peramuna (JVP) claimed responsibility for this act. Vijaya Kumaratunga's funeral, remains to date, the largest attended funeral of any politician or film idol in Sri Lanka. Their two children, Yasodhara Kumaratunga Walker (born 1980) is a Medical Doctor (Corpus Christi College, University of Cambridge and St George's Medical School, University of London), and Vimukthi Kumaratunga (born 1982) is a Veterinary Surgeon University of Bristol, UK. Kumaratunga rise to power in the context of Asia, where "the prominence of female dynastic leadership" has generated discussion, has resulted in speculation about why Asia appears to have produced more women leaders than other regions. In his study, Thompson suggests that "given Asia's enormous cultural diversity" culture alone does not readily answer the question, "why Asis?" He does think that the "saddening pervasiveness of political assassination" in the region is a contributory factor. Women such as Kumaratunga may appear "better able to offer a 'soft sell' of their murdered or disgraced husbands or fathers in election campaigns, playing to growing nostalgia for earlier, 'better times'. Another explanation is that as women they symbolize a popular desire for reform of the male dominated status quo, Their gender also enables them more easily to dispel fears that their dynastic origins might undercut this reformist orientation. Thompson suggests that in volatile political contexts, the choice of a female leader (there were male family members who might have filled the role) had advantages; they "appeared less threatening to ambitious opposition rivals." In 2004, the World Bank considered Sri Lanka one of the most unstable countries in the world. Also, says Thompson, the supporters of women such as Kumaratunga could appeal to them as "mothers" or "sisters" of "a suffering nations"; "they promised to cleanse the soiled public realm with private, familial virtue" while "their apparent non-partisan, self-sacrifice and even inexperience emphasized" the "moral struggle". The BBC points out that in the case of Kumaratunga, her academic credentials made it less easy for opponents to dismiss her as a "'a "kitchen woman'—somebody who knew all about cooking, but nothing about running a country." Several Asian countries have produced women leaders whose husbands or fathers had also served as heads of government or of state and had been assassinated. This has led to some being dismissive of their achievements as dependent on their dynastic legacy. Others have pointed out that such women have their own skills and brought particular experiences into the political arena. Their achievements should not be dismissed simply because they belong to political families anymore than that of U.S. Presidents John Quincy Adams or George W. Bush. During her time in power, Kumaratunga’s popularity, especially among the ethnic minorities, was such that entrepreneurs in northern Jaffna manufactured bangles that came to be known as Chandrika Bangles. Indeed, Kumaratunga’s ability to swing public opinion and create awareness about the merits of power-sharing is considered one of her biggest achievements, even by her most severe critics. As she told Susan Price of the BBC News in 1999, she considered achieving peace to be, with "good governance:, the "main issue"; "The main issue is good governance and achieving a true and durable peace." Both critics and supporters have referred to her as "Queen." ↑ 1.0 1.1 (2005), Profile: Chandrika Kumaratunga BBC. Retrieved July 14, 2008. ↑ #25 Chandrika Kumaratunga Forbes Magazine. Retrieved July 14, 2008. ↑ 3.0 3.1 She stated, "I don't think any individual [is] indispensable. But there are times in the history of a country when circumstances converge in a particular manner where people are called upon to lead historic processes." ↑ 4.0 4.1 Chandrika Kumaratunga: Politics in the blood BBC News. Retrieved July 14, 2008. ↑ Susan Price (1999), Presidential poll in Sri Lanka BBC News. Retrieved July 14, 2008. ↑ Alex Perry (2004), Kumaratunga Interview Time Asia. Retrieved July 14, 2008. ↑ Shimali Senanayake (2005), Lanka crisis over tsunami aid rediff.com. Retrieved July 14, 2008. ↑ 8.0 8.1 Dilrukshi Handunnetti, The Queen ponders a return HIMAL South Asian. Retrieved July 14, 2008. ↑ Mark R. Thompson, Democratic Revolutions: Asia and Eastern Europe (New York, NY: Routledge, 2003, ISBN 9780415304153), 38. ↑ Assassination has not, though, featured in the narratives of all South Asian women leaders: Indira Gandhi's father was not assassinated; neither was Megawati Sukarnoputri's although he was forced out of office. ↑ Unstable Politics Hurt Sri Lankan investments World Bank. Retrieved July 14, 2008. ↑ The term "dynasty" is also inappropriate, since succession to power was via election, not inherited. Hussain Haqqani (2008), Advancing the Bhutto Legacy The Boston Globe. Retrieved July 14, 2008. ↑ M. J. R. David (2005), What is the Kumaratunga legacy? BBC November 18. Retrieved July 14, 2008. Ayivan, Vikṭar. 2007. The queen of deceit. Maharagama, LK: Ravaya Publishers. ISBN 9789551468040. This page was last modified on 25 January 2017, at 21:47.